SHIMIZU S-PULSE vs KASHIWA REYSOL (April 28th 2018) LIVE COVERAGE! FULL TIME: The jinx is finally broken! 90′ + 2′ another Reysol’s shot flying over the bar! Reysol putting the pressure on! 87′ Long range shot by Reysol flying ier the bar. Matsubara in on for Futami. 81′ Dangerous Reysol’s kick just past right post! And Chong Tese misses immediately after for S-Pulse! Game getting a bit crazy! 76′ Another great save by Rokutan! Corner kick wasted. Ishige in for Kaneko. 75′ Great occasion created by Duke but wasted into corner kick! 69′ dangerous kick from Reysol that flies over the bar! 68′ S-Pulse almost caught unawares! 66′ dangerous free kick for Reysol. wasted. 62′ Corner kick for Reysol. Lopes for Nkagawa for Reysol. Corner kick wasted. 60′ S-Pulse sees three shots blocked! Dangerous freee kick for S-Pulsee! Ball hits the post! Tezuka in for Otani for Reysol. 48′ S-Pulse misses a golden occasion 5 meters from goal! 48′ Corner kick for S-Pulse. Goal keeper has to interfere to save his goal! 47′ S-pulse being very dangerous and unlucky not to get a penalty kick! 43′ Reysol being dangerous and SPulse being a bit apathetic. for Rokutan’s saves. S-Pulse will have to keep more possession in the middle if they want to cash on their advantage! 45+1 incredible save by Rokutan against a long range shot deviated halfway by the strong wind! 44′ A quick counter by S-Pulse unfortunately finishes over the bar! 41′ GOAL! A quick counter sees Kitafgawa beat two defenders and slot the ball past the keeper! 40′ GOAL! And such a stupid one at That by CHRISTIANO who shot from long range after S-Pulse tried to be too clever! 37′ Corner kick for sPulse. GOAL! Splendid heading by CHONG Tese! A bit against the run of play! But we will take it! 27′ Dangerous free kick for Reysol! Like a short corner kick! Barely saved into corner kick! Futami yellow carded.Another great save from Rokutan! 22′ s-Pulse living dangerously and Rokutan was forced to produce a great save! Corner kick for Reysol. Inconclusive. 17′ Very dangerous attack by Reysol barelysaved away! 16′ Corner kick for Reysol. Inconclusive. 12′ Corner kick for Reysol. Wasted. 8′ Corner kick for Reysol. Inconclusive. 7′ Corner kick for Reysol. Inconclusive. 6′ Splendid attack by S-Pulse finishing on sahrp shot saved with difficulty! Corner kick. wasted. 27 Free kick for S-Pulse 28 meters right of goal. Wasted by foul. 17 Corner kick for Reysol. Inconclusive. Note the return of FREIRE from Injury. ISHIGE and MATSUBARA start on the ench. Mount Fuji is with us today! 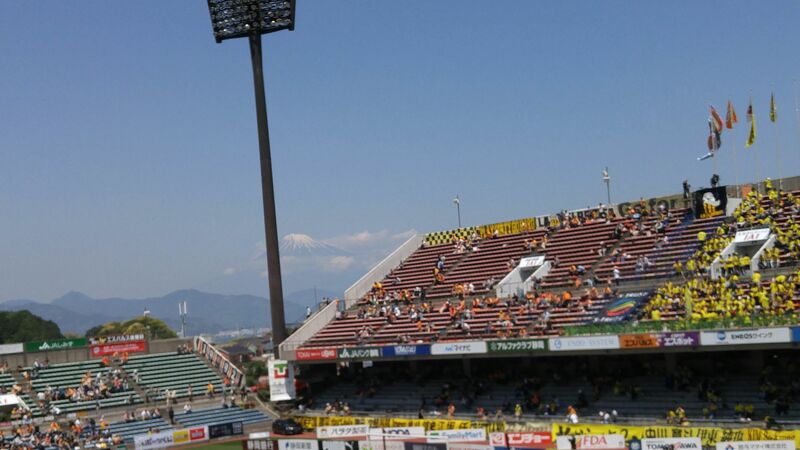 Shimizu S-Pulse is hosting Kashiwa Reysol for the 11th game of the J1 League. Will they finally break the home games jinx? Previous PostSHIMIZU S-PULSE vs FC TOKYO (, April 21st 2018) LIVE COVERAGE!Next PostSHIMIZU S-PULSE vs SHONAN BELLMARE (May 12th 2018) LIVE COVERAGE!